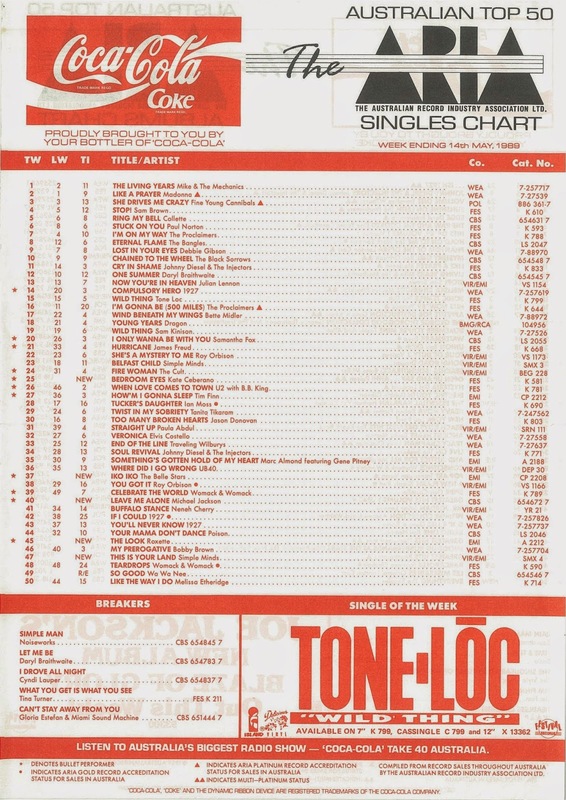 In the pre-internet dark ages, it was not unusual for Australia to be quite behind the times when it came to songs hitting our singles chart. But since there was no quick and easy way to access international charts, and no YouTube to listen to songs in the US or UK top 10 anyway, music fans were often none the wiser about the delay. By way of contrast, these days, thanks to Australia's instant release system, it's more usual for songs to hit the ARIA top 10 before they're even released in the US or UK. Sometimes back in the '80s, however, there were additional reasons why a particular song was delayed in becoming a hit in Australia or why an act's music took its time to reach our shores. This week in 1989, there were a few examples of situations where other factors than just the normal lag were at play. Also taking its time was the number 1 single this week in 1989, with Mike + The Mechanics' "The Living Years" ascending to the top spot in its 11th week on the top 50, and in the process knocking off "Like A Prayer". But, it would be a fool who thought Madonna would give up number 1 without a fight. Miami Sound Machine (with and without Gloria Estefan as named vocalist) had never been as big in Australia as they were in the US. Only 1984's "Dr Beat" and 1988's "Anything For You" had done that well locally, both just missing the top 10. "Can't Stay Away From You" was one of many top 10 hits the band enjoyed Stateside - but it had been released way back in November 1987, peaking at number 6 in the US in March 1988. So why the delay in it charting in Australia? Well, the song had actually been released here in early 1988 and managed to creep to number 98 in May that year, but here it was again a year later making further progress up the top 100. Presumably, since upbeat track "1-2-3" had failed to follow "Anything For You" into the ARIA top 50, Epic Records thought re-releasing another ballad would do the trick. They were kind of on the right track, but it would take another year for Gloria, who'd then gone solo, to return to the Australian top 20 - yes, with a ballad. Here's a second song that had originally been released in 1987 - but in this case, "What You Get Is What You See" had been successful in Australia first time around. One of eight singles from the Break Every Rule album (although not all tracks were released in every territory), it was re-released locally in 1989 off the back of its use in a rugby league advertisement (which you can watch below) that was clearly aimed at making the sport more appealing to women. It was the first TV commercial in what would end up being a long association between Tina and the NRL. The song's reappearance in the top 60 was likely down to sales in only a certain percentage of the country, and so was probably a bigger hit in those NRL-friendly states than it would appear from its peak of number 57. This was getting a bit boring now. Previously one of the more interesting bands of the '80s, Simple Minds were still in serious mode for this second release from their Street Fighting Years album, which was released this month 25 years ago. Listen out for input from Lou Reed, who doesn't put in an appearance in the clip below, about midway through the song. Australia wasn't too far behind the US in embracing Swedish duo Roxette, who had debuted on the Billboard Hot 100 back in February 1989 with the song famously brought to the attention of American radio stations by a foreign exchange student. But, the international community in general were latecomers to the Roxette phenomenon - Look Sharp! was actually the band's second album. As for "The Look", it had been passed over as a single in Sweden for two other tracks, "Dressed For Success" and "Listen To Your Heart", while a third, "Chances", had been released in other parts of Europe. When the time finally came to give "The Look" a Swedish release, the rest of the world was ready to pounce and the song topped the chart in Australia and the US, among more than 20 other countries. Here's yet another song that dated back to 1987, but in this case, it was one that had only appeared on the CD version of Bad, so its release as a single almost two years after the album came out makes sense. Why not give non-CD owning fans (which included myself at that point in time) a chance to buy the track? Despite that fact and a Grammy Award-winning music video that poked fun at all the stories of Michael's increasingly bizarre behaviour (his pet chimp, Bubbles, his purchase of The Elephant Man's bones, his obsession with Elizabeth Taylor), Australian record buyers were mostly unmoved. The song did, however, hit number 2 in the UK, the second highest position of any single from Bad there. Meanwhile, in the States, "Leave Me Alone" was not released as a single at all. We go back even further now - in fact, it was almost seven years since this cover of The Dixie Cups' 1965 single had just scraped into the UK top 40 (while a rival version by Natasha hit the top 10 there at the same time). The revival of The Belle Stars' version of "Iko Iko" was yet another chart hit of the '80s that owed its success to its use in a Tom Cruise film - in this case, Rainman. By that stage, however, the band had long since broken up, although lead vocalist Jennie Matthias promoted the track and appeared in a new music video for the release. The song itself, which originated in New Orleans and is filled with locally relevant lyrical content, has been the subject of a number of legal disputes over the decades concerning songwriting credits, and has been covered even more frequently. So far in the '80s, Kate Ceberano had been the lead singer of mid-'80s pop/funk band I'm Talking, performed as a backing vocalist for Models, released a live jazz album and, together with Wendy Matthews, recorded the soundtrack to TV series Stingers. One thing remained for her to achieve - and with "Bedroom Eyes", Kate landed her first solo hit single. And, what a hit it would turn out to be, spending six non-consecutive weeks stuck at number 2 (behind Bette Midler, The Bangles and Roxette) and going on to become the highest-selling single by an Australian artist in 1989. Next week: a massively popular heavy metal band land their first top 50 hit, a mid-'80s superstar returns and five more songs debut on the singles chart. I was nearly going to ask ARIA for the peak position of 'Can't Stay Away From You', so it's great to have been spared the effort. It's one of those singles from this period that peaked inside the AMR top 50, but not on ARIA. Despite not living in NSW, I have a vague memory of seeing that Tina Turner NRL ad now; or maybe part of it featured on some 60 Minutes special or similar. I do wonder though what makes people suddenly decide to buy a 2 year-old single that was already a hit (and played a lot on radio too), just because it's now associated with a sport TV commercial. The Belle Stars' 'Iko Iko' sounded 'current' to me upon hearing it for the first time in 1989. I still can't get my head around it being 7 years old at that point. It doesn't sound as dated as nearly all 1982 tracks would to my ears at that point; perhaps because it's quite different. I can't seem to find an original 1982 music video for it on youtube either; or even a TV performance from then. I was quite surprised that it cracked the top 50 here, though I guess the movie tie-in helped. I remember being surprised that 'Too Many Broken Hearts' tumbled from 16 to 30 this week. I guess it was a sign that Jason would soon be on the way out. Poor Kate (and Ian Moss) for not scoring a solo No.1 single, and both with their debuts. However, both were the 2 biggest Aussie artists of 1989 with their albums. Once again, thanks for the heads up on 'Leave Me Alone' not being released as a single in the US and only appearing on the CD version of 'Bad'. It is a great video and when Michael re-released his singles on CD a few years back, I snapped up 'Leave Me Alone' when it finally followed his previous re-releases. Like Nathan, I thought 'Iko Iko' was a new release, but I was always left wondering why is it only 1 person shown and not the group? Was it the same group that gave us 'The Clapping Song' all those years ago? I first stumbled on the 12" video of this song. I think 'The Factory' played it? It was pretty much the first 12" I owned and I thought it was great and of course so was the 12" video. Yep, same ones who did The Clapping Song (which was a UK hit and was taken from the same album as Iko Iko) and Sign Of The Times (no relation to the Prince song of the almost same name). I had forgotten Kate was runner-up for quite so many weeks. I love the Brave album. I wish she released another Brave follow up. Hey, if you're onto a good thing stick to it, but she always said she never wanted to make another Brave. For a while there commercial success eluded her until she made a comeback in early '98 with the Top 10 single 'Pash'. Ian Moss struggled as well, trying to follow up on the success of 'Matchbook'. I thought his follow up wasn't bad, but no one really got onto it. I was surprised at how quickly Kate's commercial success declined after 'Brave'. I thought 'Every Little Thing' would have been massive, and was even more surprised to see the chart-rigging $0.99 (from memory, including on CD) 'See Right Through' single (which I hadn't heard before it entered the chart) eclipse it by one position. Kate had a string of 'hits' peaking between #88 and #100 from 1992 until 1996 (the Jesus Christ Superstar tracks being the only exception). I'm surprised Festival/Regular Records didn't 'drop' her during that time. I even remember there being some Today Tonight/A Current Affair-type show segment on the 'Blue Box' album when it was released, for promotion. Just noticed on her wikipedia page someone has put 'Dindi' (a 'Like Now' single) peaking at #105 in Australia in 1990... interesting. I remember catching Ian Moss's 'Slip Away' once in the 51-60 region of the rage top 60, but I think that was the only time I ever heard/saw it. Chart rigging $0.99 cents? that's def. chart placing before profits. Remember when some CD singles in the late 90's were $10 and some were $2, very inconsistant. Re Kate, I sent her an email about 8 years ago saying how she should record a cover of the Time Bandits 'Endless Road' and she personally replied back and said thanks for the idea, then she quickly digressed and told me all about her upcoming album '19 Days In New York'. LoL. Then when her covers album came out around 2007 (on the back of Dancing With The Stars), I was keen to see if she covered it, but no go. Then just recently, I got onto Deni Hines website and told her that the track would really suit her voice and take her back to the top of the charts. Still no reply. LoL. It's ridiculous that the sales required for platinum and gold haven't gone up as cost of a single/track have gone down. If you adjusted for inflation, the cost of buying a 7" single for $4 in 1989 would be the equivalent of a lot more now - no wonder things are going 7 or 8 times platinum quite easily. Re Kate, I interviewed her for a new bio a few years ago and said I'd love her to do another album like Brave or Think About It, and she seemed open to the idea. I also love Endless Road! According to the RBA's Inflation Calculator (which is available online), $4 in 1989 would be equivalent to $7.73 in 2013 (it only goes up to the previous year) dollars. So, really they should multiply the sales required for gold and platinum accreditations by about 5 or 6. I don't use iTunes so I don't know what the going rate is. 1m = 0.004089979 of 244.5m (so, for a Platinum cert in the US back then, 0.41% of the population had to purchase the product). Approximately 0.41% of the Australian population at the time = 67 800. Round this figure up to the nearest 5000 and voila! 70k (Platinum). I remember reading this somewhere back when the levels were changed. The idea behind both countries changing their certification levels was to allow more product to be recognised, since sales had plummeted since the early 80s and very little product was being certified. It's interesting that since these comments were made nearly 3 years ago, sales have plummeted again (thanks for nothing, streaming!). I don't know if you'll see this Carta, but if you do, do you know of any published source that mentions the lowering of the ARIA gold/platinum thresholds in 1989? I was trying to explain it to someone on wikipedia ages ago, but couldn't provide a source other than what I remember reading in a Smash Hits article at the time.